That’s why I’m glad to have come across the Fisher-Price Laugh & Learn Apptivity iPhone Case . It’s seriously great, and completely encloses and protects your iPhone / iPod touch so that it’s protected from all things baby; snot, drool, boogers, tiny teeth, and all of the other wonderful things that babies produce. 🙂 Besides just protecting your iPhone / iPod touch, it has a fun mirror on the reverse side, and lots of teething toys for your baby to chew on. Also I’m not sure if you can tell from the pictures but your iPhone / iPod touch’s screen is also protected behind a plastic cover. This case may look like a baby toy, but it’s seriously like a mini-tank for your precious i device. It’s nice to be able to put your phone in this case, give it to your child and trust that they can have some developmental fun without breaking something that you probably paid a pretty penny for. 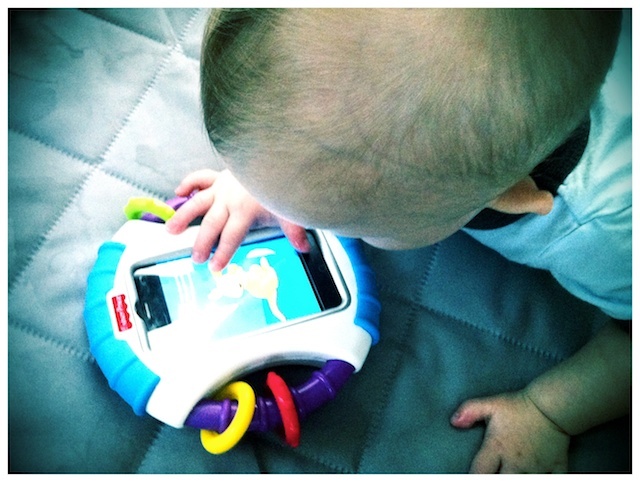 The Apptivity iPhone case also comes with several fun, and free, iPhone / iPod touch apps that Noah seems to really enjoy. Sure, they aren’t nearly as awesome as this one, but since they are free…..that’s what I call a win! By the way, before you invest in this case (or any apple device) be sure to check out these 3 free gifts your child will like even better than an iPad! It’s so much fun watching Noah play in his Pack N’ Play…he doesn’t go in there much (it’s so hard to let him out of our hands…we just want to hug him all day long!) but when does he really has a blast in there. It’s amazing watching his sense of wonder grow. Everything is so exciting and new for him, I love it. Noah has a ball in his pack n play! Does your child use an iPad / iPhone / iPod touch? What are some of their / your favorite apps? Oh dear God does Little Man love our iPhones (and dadddy’s iPads and our laptops and remotes and anything else that belongs to us that he shouldn’t hate)…he knows how to unlock it (sort of) and he knows that if he puts his finger on the screen, things happen. He hasn’t quite figured out how to do much else but he loves technology. He also loves books…but funnily enough, he doesn’t like books on the iPhone or iPad. One thing I really like about this case is how the phone is ‘locked’ in. You have to use a coin to open up the case in order to put the phone in, and or take the phone out. Like I said..it’s like a tank. Fisher Price did a great job with this one. That is amazing! I can’t believe I didn’t know about this already..would have been nice to have before Jessica dropped our Ipod and broke a piece right off. But it still works! Nothing a little Scotch tape won’t fix 🙂 Jessica (who just turned 3) LOVES the Ipod! We have flash card apps, story books, matching games and all sorts of great kid apps…BUT, Jessica being Jessica likes the one where you squish the bugs and ‘office jerk’ the best. Sad, I know..but still so good for the eye/hand co-ordination. haha! She has been turning it on and off by herself for, well, ever since we got it, and she also loves to go into the music and play all the songs. I LOVE watching those little fingers work! There is a great website, http://www.a4cwsn.com that reviews Apps for children with special needs and education in general and on their facebook page they give away free apps (and even Ipads)! It’s a pretty cool thing! Going to go find where I can get the cover now. Thank you SO much for sharing!!! Thanks for posting that link, I’ll have to check it out. I just wanted you to know how inspired I am by your family’s story. I am a subscriber! 🙂 Your most recent comment to one of your readers really made me catch my breath. I had to write it down on a sticky note to place on my mirror…. “God wants to tell a very unique story through your family”. Wow! God inspired. Then I thought, I think this is true of all of us. You have such an amazing ability to communicate and I am so grateful you are using it to remind us that God wants to tell a unique story in all our lives, if we are only willing to let Him. Thank you, Rick, for being His faithful servant. Thank you so much. I really appreciate the encouragement and support. Do you have any children? Thanks for your comment. We actually don’t have any of those apps, but we’ll be checking them out for sure! Another beautiful post! Just curious… are my comments coming through? And yes, I just got this one. Sorry our inbox is crazy right now, so it’s taking a bit of time to reply to comments and messages. So sorry. Again…maybe it’s just because Autism is such a buzz-word right now, but there are more results when I look for apps through other disabilities. When you go into the actual programs, they are perfect for all children. Some of our favorites are pro lo quo: for augmentative communication, articulation station for speech sounds, iwrite words for learning to draw letters and numbers correctly, Parents Flash Cards, Touch Emotions, My First Apps by Alligator Apps makes a lot of vocabulary pictures…we like the ones that use real photographs and not drawings. My kids seem to tune in and learn so much easier with the actual items than with a cartoon or it. TouchScreenPreschoolGames.com has a good connect the dots that works those fingers. They also have a really nice preschool memory match game that my kids love and when they finish a board they are rewarded with 3 music “toys” to play with which they look forward to! All the apps from “My First App” are good for early learners at about 2-3 years old. Then for slightly older kids, “Shoe the Goose” makes a series of apps that we love such as cookie doodle (our personal favorite) where you put the ingredients into a bowl to make cookies, stir it up, put it into the oven, frost, decorate, and eat your virtual cookies! All around fun through learning at all levels. Wow, those sounds like great ideas…thanks so much for sharing them. What a beautiful baby!! Love your 1 minute video’s and your energy. Found your blog on facebook. Thanks for sharing! @Sara – Thanks so much! Looking forward to sharing our journey with you. What a fantastic invention! This also shows how typical kids who have Down Syndrome are! All children like shiny, noisy, toys!! Indeed! It’s amazing how how at such a young age kids (even babies) seem to learn to use technology very quickly. Yikes – already working the iPhone! Is he going to be a techi some day? LOL! Cute video – loved the shots of his feet playing with the green ball! 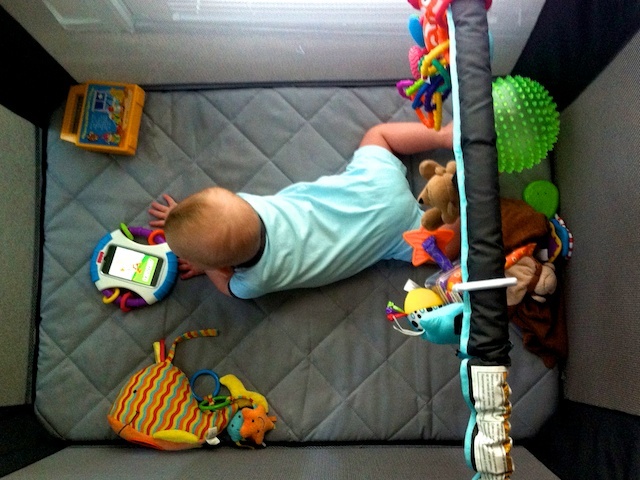 That was a pretty amazing child rocking on its 9 month an iPhone.